James' life was in many ways a lonely one – he never knew his parents, although he felt affection for his wife, they were not close, and he suffered numerous abduction and assassination attempts. Yet these vicissitudes did not sour him nor make him vindictive. Instead, he tried to reconcile competing religious views, unite his two kingdoms and make peace in place of war. Sadly, his efforts never achieved complete success. James travelled extensively around the lowlands and eastern Scotland and even went to Denmark to rescue his ship-wrecked bride. Once in England, he undertook the usual royal progresses, which became an increasing financial burden on his subjects. Although James is not one of the best known of British monarchs, during his reign the ultimate flourishing of Shakespeare, Ben Johnson and the architect Inigo Jones took place. James’ obsession with witchcraft is one of the most difficult things for modern minds to comprehend, but it resulted in a wave of persecution – which he may have regretted in the end. James’greatest claim to fame however, is his sponsoring of the King James Authorised Version of the Bible – the best selling book ever published in English. There are few books about James, although interest in him is increasing and there is a general reassessment of him as a more effective King than he is often credited with being. A recent biography is John Matusiak’s 'James I: Scotland’s King of England'. 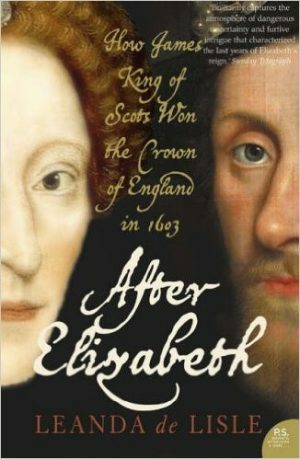 An interesting take on the transition period of 1603 – 4 is Leanda de Lisle’s ‘After Elizabeth: The death of Elizabeth and the coming of King James' which is reviewed here.